The Zapotec site of Lambityeco, just west of Tlacolula in Mexico’s Oaxaca Valley, reached its apogee in the Late Classic and Early Postclassical period (500–850 A.D.). It was a major center of trade and was the dominant producer of salt in the Oaxaca Valley. Around the same time, the city-state of Monte Albán 100 miles south of Lambityeco came to the fore as the capital of the Zapotec nation. It was much larger than Lambityeco, with a peak population of some 25,000 people. When Lambityeco was first excavated in the 1960s, archaeologists discovered art and architectural elements that appeared to be strongly influenced by Monte Albán. Other artifacts indicated marked differences between the two cities, marked enough that archaeologists believed that Lambityeco dated to a later time period than Monte Albán. The archaeological record has been reinterpreted in recent years. Now researchers believe the two cities were indeed contemporaneous. Archaeologists from Chicago’s Field Museum have been excavating Lambityeco for the past four years, expanding the area of the city that has been explored archaeologically and revealing more about the city’s relationship with Monte Albán. They found that the public buildings in Lambityeco’s civic center were initially laid out in much the same manner as Monte Albán’s public buildings. At some point, however, Lambityeco restructured its center, remodeling buildings and moving bits of them around so that its similarity with Monte Albán was erased. This is likely the result of a political shift in the two cities from alliance to opposition. 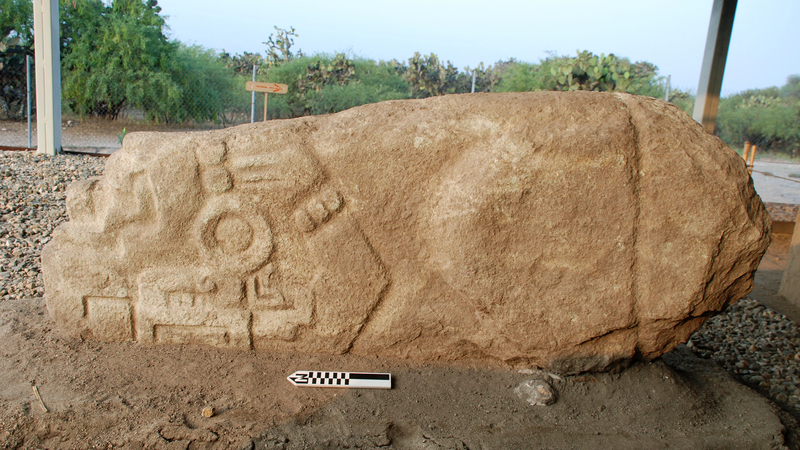 This season, the Field Museum team unearthed another artifact that contributes to our understanding of the ancient dynamic between the Zapotec urban centers. It’s a stone carved into the image of a crocodile on three sides. It’s the largest carved stone yet discovered at Lambityeco, and the first crocodile stone. Crocodile stones have been found at other Zapotec sites in the Oaxaca Valley, but most of them have been moved around over the centuries and are long divorced from their pre-Hispanic context. This one was moved, yes, but it was moved in Lambityeco’s heyday. The stone was moved so that it leaned against the new façade of the building, where it continued to serve ritual significance, as evidenced by remains of charcoal and ceramics used to hold incense that were deposited right in front of the stone. The stone, when found in this location, was upside down with one of its carved sides completely hidden from view. These observations further indicate that the stone had been repositioned from its original location. This entry was posted on Friday, September 2nd, 2016 at 11:17 PM	and is filed under Ancient. You can follow any responses to this entry through the RSS 2.0 feed. You can skip to the end and leave a response. Pinging is currently not allowed. I’ll grant that my eyesight is lousy, but I can’t for the life of me see the croc there. My eyesight is also bad, but if you look closely on the top left hand side, there is the head and jaw of the crocodile. A bump in the middle is his (or her) back leg. And along the top is its back. The other carving on the bottom left is difficult to make out. But there is definetly a croc there. Let’s blame it on my likewise bad eyesight that seems to suggest here a bear trying to make love ‘vis a fronte’ to some form of ‘carved idol’, which I frankly find rather disturbing. “if you look closely on the top left hand side, there is the head and jaw of the crocodile.” Aha, I had seen that as a human hand, attached to the elbow below. Hey ho.